Posted on January 19, 2018 by What's For Dinner? I think I’ve found my new favorite Banana Bread! This has got to be THE most flavorful and moist banana bread I’ve ever had the pleasure of eating. The recipe comes from one of my favorite eateries in Comfort, Texas called High’s Cafe & Store…a darling little place with fabulous food! If you’re ever in the area, do yourself a favor and stop in! They’ve just come out with a great little cookbook, too, called High Made Food. I think the secret to this banana bread is baking the bananas “in their skin”, then cooling them before peeling and adding them to the batter. Whaaaaat, you ask? Yep, I’d never heard of doing that either, but boy, does it make a difference! Baking the bananas intensifies the flavor and the sweetness! 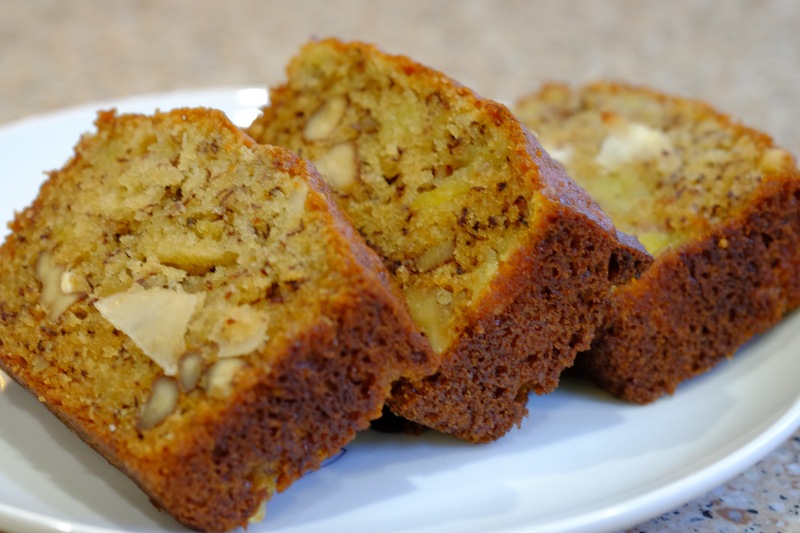 What you’ll get is the most moist and flavorful banana bread you’ve ever tasted. Can we get a big AMEN to that?? For the bananas: Preheat oven to 350 degrees. Prick 6 ripe bananas (NOT peeled) with a fork, and place on a foil lined cookie sheet. Bake for 20 minutes, then remove and let cool. They will be black and very sweet! In mixing bowl, whisk together flour, soda and salt. Add walnuts and coconut, and mix well. In a separate bowl, add bananas and sugar and mash well with a potato masher, leaving some chunks of banana. Add vanilla, eggs and oil and mix well. Add banana mix to the flour mix and use the masher to blend together. 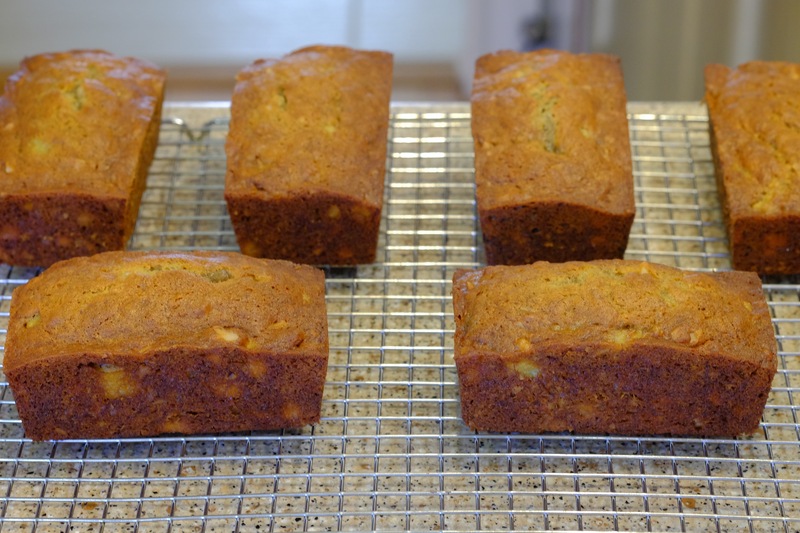 Portion into 6 prepared medium loaf pans (2 ½” x 5″). Bake in a preheated 350 degree oven for 20 minutes, rotate and bake another 20 minutes. Bread will be slightly pulling away from the sides and just set to the touch. Cool at least 20 minutes before unmolding. This recipe makes 6 medium-sized breads or 2 large. The batter can also be used for muffins. These freeze really well for up to about 4 months! Cool completely, then wrap each loaf in plastic wrap several times. Then, either wrap in foil or slip into a freezer bag. Posted on December 16, 2017 by What's For Dinner? Tis the season for festive holiday cocktails, so if you’re doing any entertaining this holiday season, these red and green showstoppers are a MUST DO! Not only are they beautiful, but also a bit fancy and SUPER easy to pull off, too! 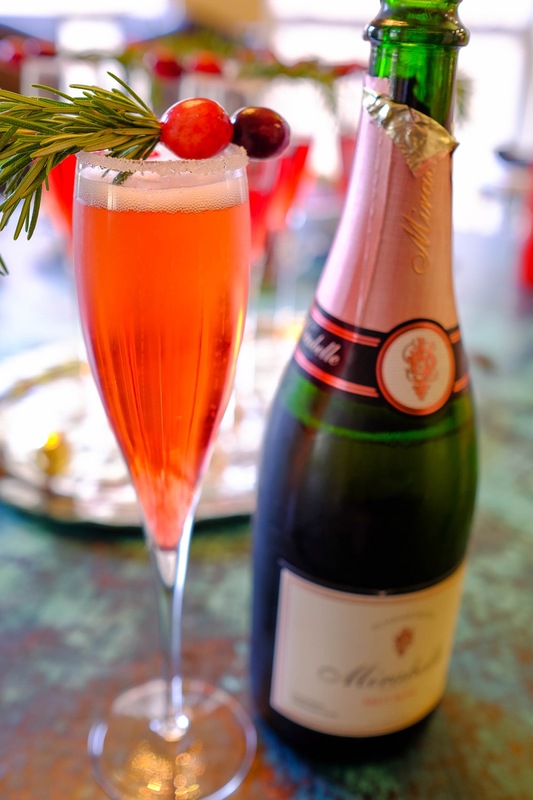 And let’s be honest…a little bubbly just makes everyone feel happy and festive! It’s a great way to start off any get together! They make a beautiful tray! Rub rims of champagne flutes with lime and dip in sugar. Pour 1/4 cup pomegranate juice into each glass and top with Champagne. Use a toothpick to poke a hole through cranberries. 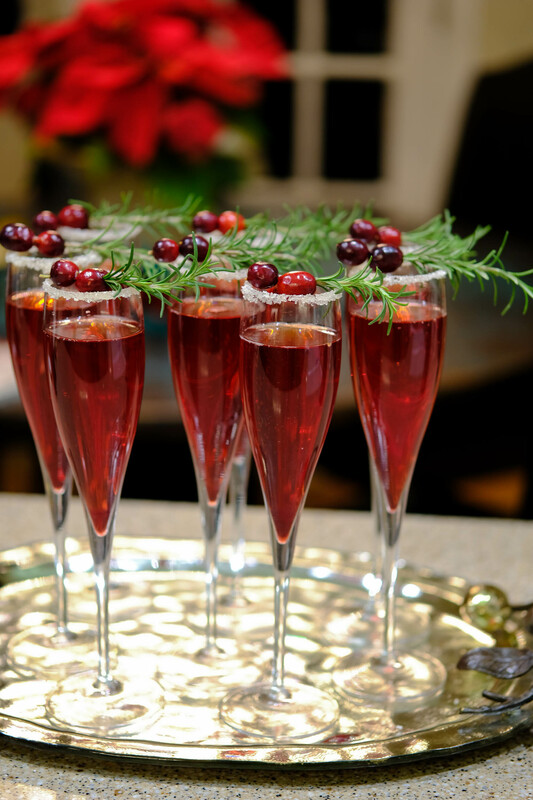 Remove bottom leaves from rosemary sprigs and thread skewer through cranberries to garnish mimosas. Feel free to substitute Cranberry juice for the Pomegranate juice. Just make sure both the juice AND Champagne are very cold! Posted on November 12, 2017 by What's For Dinner? Chicken seems to be everyone’s “go-to” protein these days, and while I love the bird just as much as the next person, let’s face it…chicken can be BORING! You know what I’m talking about..overcooked, dry, flavorless–the list goes on. Well, let me tell you, this dish absolutely ROCKS in the flavor department, and the cooking technique produces a bird so moist and tender it practically melts in your mouth! I was amazed! I’m sure you’re thinking by now, hmmm….spatchcock, confit, preserved lemons…not for me. Hold on–don’t let those words scare you off. Granted, they may not be in your everyday arsenal of kitchen jargon, but fear not! I’m hear to break it down for you, and make it simple. Spatchcock-this is nothing more than splitting, then flattening a whole bird. You do this by cutting out the backbone (not hard at all with a good pair of poultry shears or serrated knife), then pressing the bird down flat giving it much more surface contact. 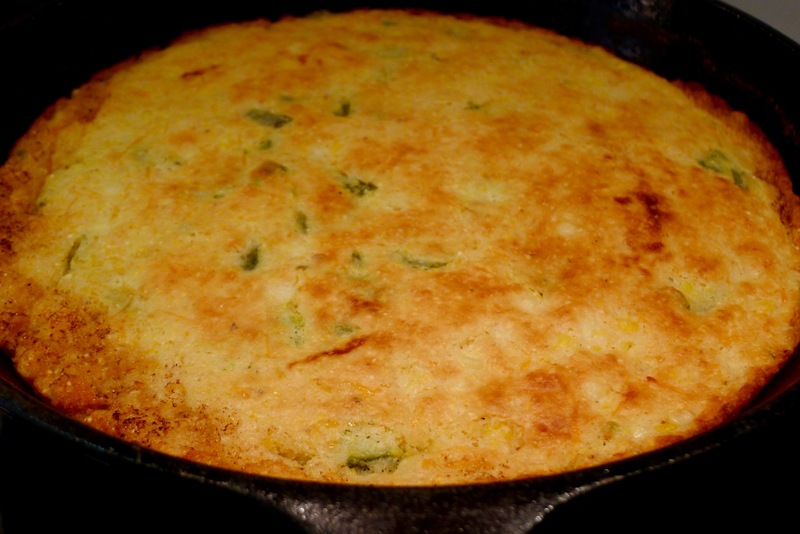 In our case, that contact is going to be with a scorching hot cast iron skillet…think “very crispy, beautiful” skin! One more advantage to this technique is that it cooks quicker! Fast AND crispy! Win, Win!! Click HERE for a step by step “how-to” on spatchcocking. Confít-don’t you just love all this learning? What IS confit, you ask? It’s french, and it generally refers to meat that’s been cooked and preserved in it’s own fat. Here, however, instead of meat we have garlic, and the fat of choice is olive oil. Quite simply, the garlic cloves are s..l..o..w..l..y simmered in the olive oil for about 30 minutes or so resulting in tender sweet cloves that just melt in your mouth. The added bonus is that you’re also left with a beautifully infused oil that is both fragrant and delicious! Preserved Lemons-I can’t say enough about these!! I have jars and jars in my fridge! They are cut lemons rubbed with salt, then packed in a jar with more salt & lemon juice. They sit at room temperature for about a month and pure magic happens. In the end, the peeling has this incredibly intense lemon flavor with no bitterness whatsoever. Click HERE for how to preserve your own lemons and a few options for how to use them once you have! You can also buy them…higher-end grocery stores will carry them, World Market has them for $5.99 a jar or you can get the same jar on Amazon Prime for $10.99. It pays to price compare! Heat garlic and oil in small saucepan over medium heat until small bubbles appear around garlic. Reduce heat and simmer “gently”, stirring occasionally until garlic is light golden brown 10-15 minutes, being careful not to burn. Let cool in pan. Adjust oven rack to lowest position, place a cast-iron skillet on rack and heat oven to 500°. Pat chicken dry with paper towels, rub with the garlic infused olive oil and season with salt & pepper. When oven reaches 500°, remove skillet from oven, place chicken breast side down and immediately reduce oven to 450°. Roast until well browned, about 30 minutes. With heavy oven mitts, remove skillet from oven, and gently flip chicken breast side up. Add cherry tomatoes, brush chicken and tomatoes with more of the garlic infused olive oil and return skillet to oven for about another 10 minutes or until breast registers 160° and tomatoes start to pop. Transfer chicken to cutting board, cover with foil and let rest 10-15 minutes. Place tomatoes in small separate bowl until sauce is ready. Add broth to skillet and bring to boil over medium high heat, scraping up browned bits and cooking until reduced by about two thirds. Add butter, one piece at a time whisking constantly until sauce thickens and coats the back of a spoon. Remove from heat and stir in lemon juice, reserved cherry tomatoes, preserved lemon, half of the herbs and all the cooked garlic cloves. Taste and season with salt & pepper. 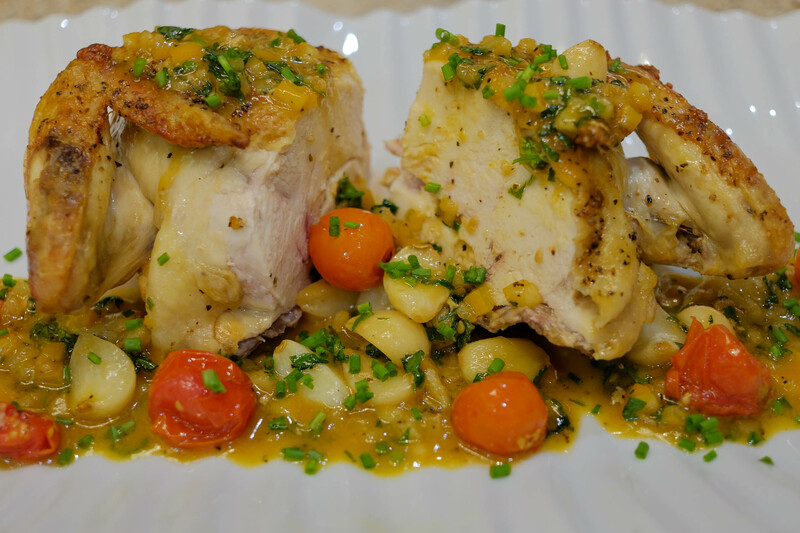 To serve, carve chicken into pieces and spoon sauce over the top, sprinkling remaining herbs on top. Posted on September 20, 2017 by What's For Dinner? “Favorite Son” came home from college for the weekend, and requested one of his favorite dishes called “Cioppino”. 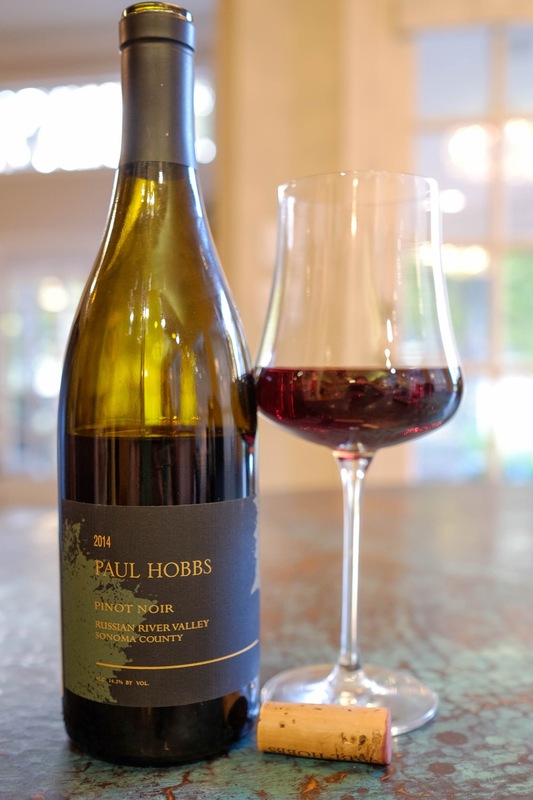 He and his dad have ALWAYS LOVED this dish, and since we were celebrating several things that evening with a very nice bottle of Champagne, I agreed. Cioppino, (pronounced chə-ˈpē-nō) actually came to the U.S. by way of Italian immigrants who had settled in the San Francisco area. If a fisherman came back at the end of the day empty handed, he would take his pot and walk around to other fisherman asking for any leftover fish they could “chip in”. Whatever ended up in their pot would become their Cioppino! The dish later became a staple as Italian restaurants started popping up all over San Francisco. Today, similar dishes are found in coastal regions throughout the Mediterranean. Generally, the seafood in the stew is cooked in broth and served in the shell. You can also serve what is called “lazy man’s cioppino”, referencing the fact that all shells have been removed prior to serving…not as much fun, but much less messy!! My fondest memory of enjoying Cioppino is from our trip to Cinque Terra in northwestern Italy. 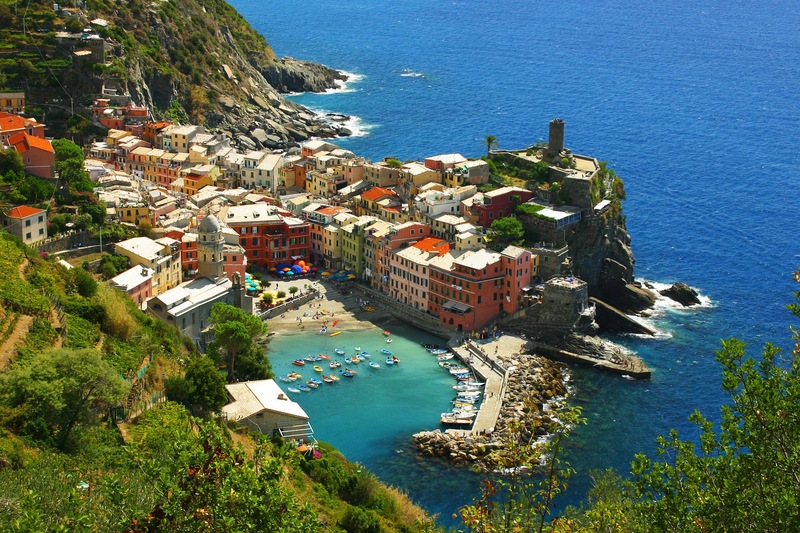 Vernazza, one of the five towns that make up the Cinque Terra region is one of the most quaint little fishing villages on the Italian Riviera…just breathtaking! 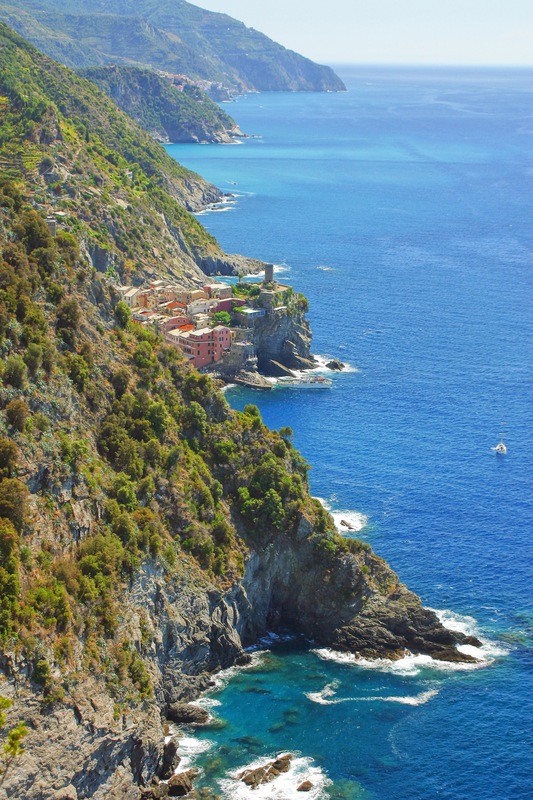 Hubby and I hiked from Monterosso al Mare (the first of the villages) up one side of the mountain and then down to the next village of Vernazza. 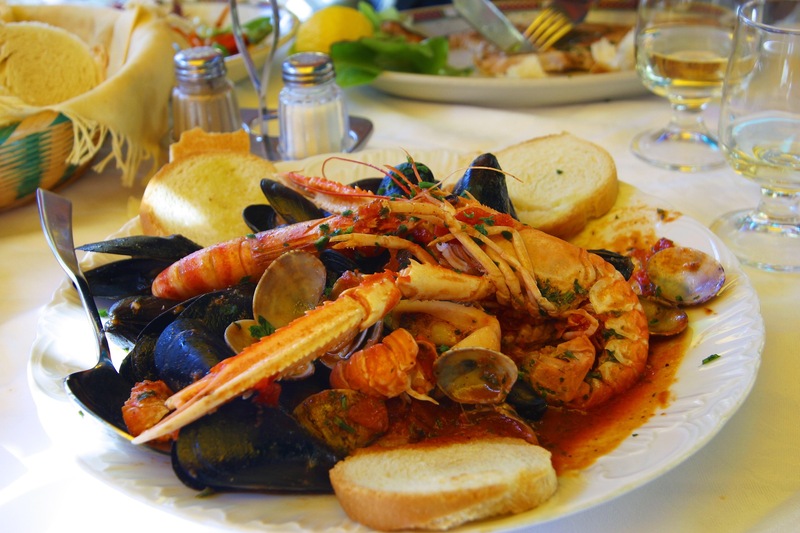 We lunched at a little cafe called Taverna Del Capitano and had the most wonderful Cioppino we’d ever tasted! 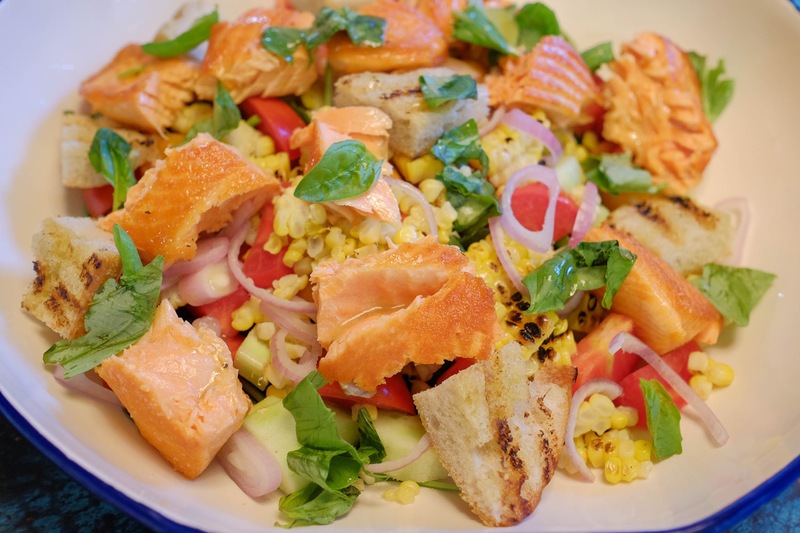 This particular recipe is one I’ve adapted from Chef Tyler Florence after trying several different styles. 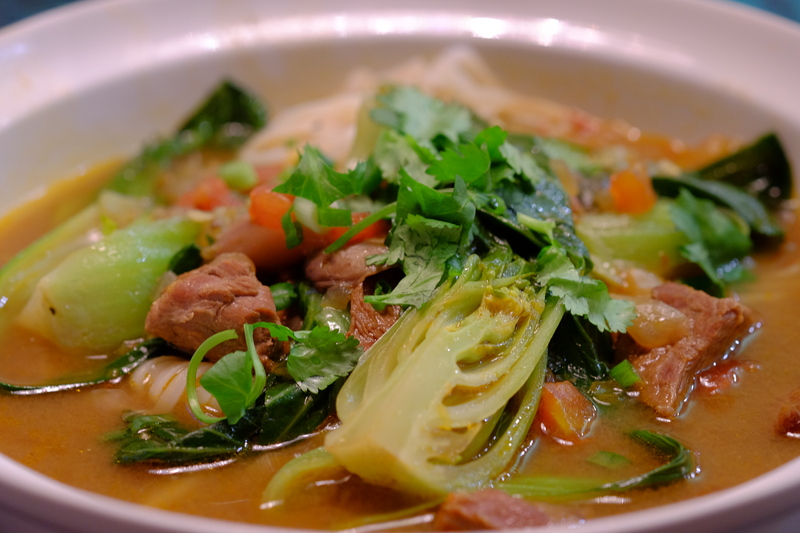 While it’s not necessarily authentic due to the added Spanish chorizo, it makes for a much heartier broth, and my boys say it’s their favorite! Please don’t mistake Spanish chorizo for Mexican chorizo–it’s definitely not the same! Click on this “link” for a wonderful Spanish chorizo that’s actually made right here in my own home town of Boerne, Texas! Serve with a nice crusty loaf of french bread for soaking up all that delicious broth! Bon Appétit!! 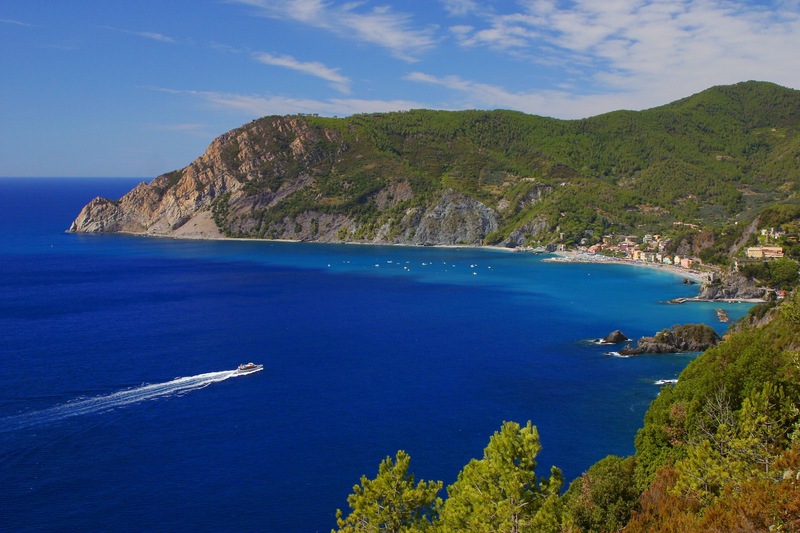 We hiked up Monterosso al Mare…about a 3 hour hike! 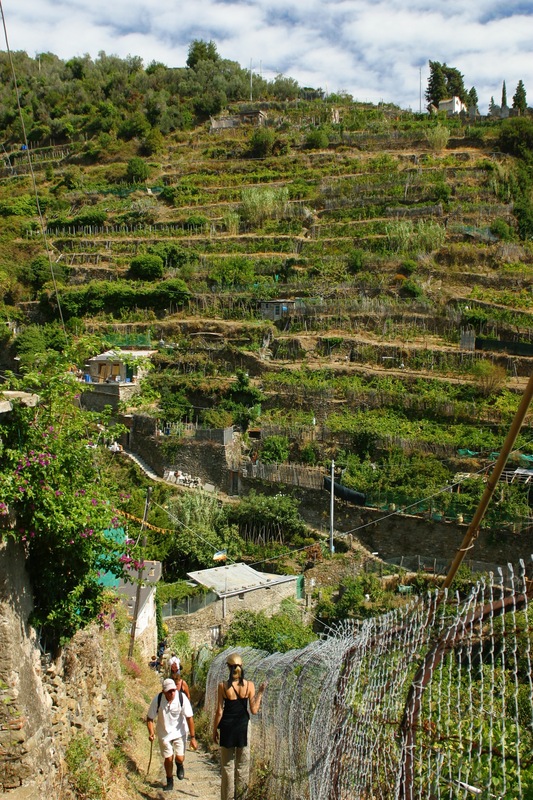 It’s a beautiful hike meandering through lots of vineyards, and the locals living along the hike are so friendly! HELLO Vernazza!! Once you’ve hiked to the top of the mountain, this is the view you feast your eyes on! Just breathtaking! Each little inlet is it’s own fishing village only accessible by boat or train. In the bowl of a food processor, place chorizo, onion, garlic, celery and tomatoes, and pulse until pieces are small and well ground up. Transfer this mixture to a Dutch oven, and cook over medium heat until well colored and fat is rendered. Once cooked, add the flour, thyme and bay leaves, and sauté for another 5 to 7 minutes (this forms the base of a roux). Add red wine, reserved tomato juice and chicken stock. Season lightly with salt and pepper, then cover and simmer for 30 minutes. With 10 minutes left go, bring to a boil and add the clams and mussels. Cover and steam until mussels and clams open (5-7 minutes) and discard any that don’t open. Reduce the heat to simmer, nestle fish into bottom of pot, add scallops and shrimp, cover, and simmer just until cooked. This will only take a few minutes, so be careful not to overcook. Remove the bay leaves, ladle into large shallow bowls and sprinkle with chopped parsley. Serve with a crusty french bread! Any mixture of seafood will work in this stew, so choose your favorites! Throw in some crab legs or maybe try a couple of whole Dungeness crabs (cut into about 6 pieces). If you don’t like cod, try halibut or any other firm white fish. Just add all the seafood at the last part of cooking so it’s not overcooked! I can’t emphasize enough the importance of using “Spanish” chorizo and NOT Mexican chorizo.